As part of the utility services that are provided to our residents, the City will arrange for a wheeled trash receptacle to be delivered to your residence. Garbage pickup is every Tuesday. 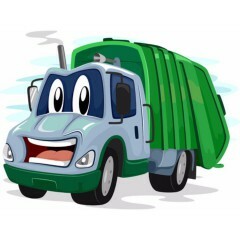 The City asks that you place your trash at curbside the evening prior or first thing in the morning. If the scheduled day for pickup is a holiday, regular service resumes the next business day. If you wish to partake in the recycling program, you may pick up a bin or two from City Hall. Recycling Pickup is every other Tuesday. Please place your bins at curbside the night before or first thing in the morning. Separation of items is not required at this time. Please visit www.republicservices.com/recycling-guide for more recycling information. For larger items, the City has available Bulky Item stickers. Please place the sticker in a dominant place on the item and put the item out the night before or the morning of pickup. Oversized items must be able to be lifted by the serviceman alone in order to be removed from your site.